Students in the 2016 competition set their robotic vehicles on a variety of missions set up in the pool, such as surveying and retrieving samples from a moon-like surface and collecting a coral sample from the deep sea. Photo by Alex Masters. 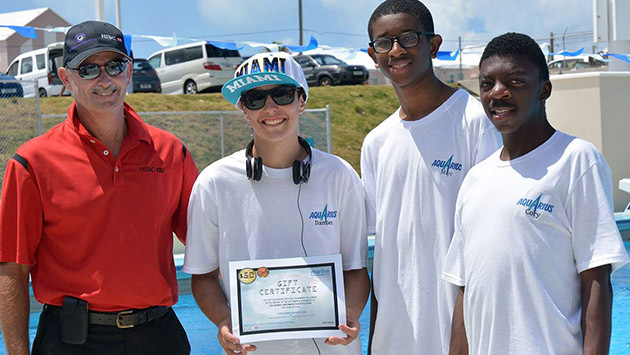 Twenty-five teams from 12 Bermuda schools and educational organizations will converge on the National Sports Centre on Saturday, April 22, for the 2017 MATE Bermuda Regional Remotely Operated Vehicle (ROV) Challenge. The program, hosted by BIOS, is part of the Mid-Atlantic Robotics IN Education Program (MARINE), with lead donor support from HSBC. Globally, HSBC focuses on supporting educational initiatives that promote learning about the natural environment. 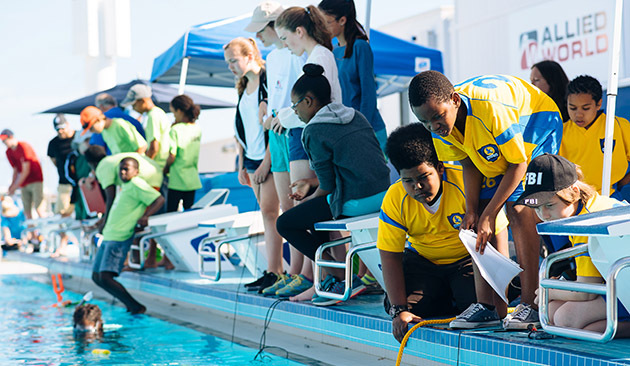 In Bermuda, HSBC has partnered with BIOS for the past three years in support of MARINE and the ROV Challenge, which teaches young people about the world's oceans, and the importance of preserving them. The Aquarius team from Learning Express Academy won second place for the competition's Navigator class in 2016 (shown here with Christopher Brown of HSBC). The challenge reflects BIOS’s commitment to using underwater vehicles to understand complex ocean processes, Baird said. Building ROVs fosters critical thinking skills, enhances individual and group problem solving skills, and boosts technological fluency. It also supports education goals associated with science, technology, engineering, and mathematics, known as the STEM fields. For the 2017 piloting challenge, MARINE will again partner with the Marine Advanced Technology Education (MATE) center to host a regional challenge. Community support comes from the Orange Bay Company, a Bermuda consignment shop based in Hamilton, which is donating pizza lunch the day of the competition.